After Apple's latest dig at PC users, we find out how the new iPad Pro really stacks up against Pro PC tablets. Apple thinks PC users are ready to make the jump to the iPad Pro. Not to the original 13-inch iPad Pro, which everyone can agree is just too damned large and pricey. But to the newly announced 9.7-inch iPad Pro, which the company expects Windows PC users will adopt in droves. Obviously, a claim like that can’t go unchallenged. To see how the new iPad Pro really stacks up, I put it against its two natural Windows-based competitors: Microsoft’s Surface Pro 4 and Samsung’s Galaxy ProTab S. Read on to see how the new iPad Pro rates in several key categories. I’m going to ignore the 32GB iPad Pro here (seriously, 32GB? ), and focus on the 128GB model, for an apples-to-apples comparison. I’m also throwing in the peripheral goodies, because a productivity tablet without the keyboard or pen isn’t actually productive. That puts the iPad Pro right at $997. That’s slightly cheaper than the Surface Pro 4 with its optional keyboard (pen is included) at $1,029. That Surface Pro 4 model comes with 128GB of storage, 4GB of RAM, and a Core i5 Skylake CPU. Samsung’s Galaxy TabPro S is decently priced. For $899, you get 4GB of RAM, 128GB of storage, a Core m3 CPU, and the keyboard, which comes stock. The only unknown is the price of the as-yet-unavailable pen for the Galaxy TabPro S. If it’s, say, $50, I’d say we have a three-way tie on the price front. Apple’s A9X isn’t really faster than Intel’s x86 chips, but it’s getting closer than you might think. I could expend 3,000 words on why the iPad Pro isn’t really faster than a PC, or you can just read this story. Because the new, smaller iPad Pro has the same CPU, I expect the performance to be the same or slightly worse. So this is one category where I’m pretty comfortable making a ruling without ever touching the hardware. 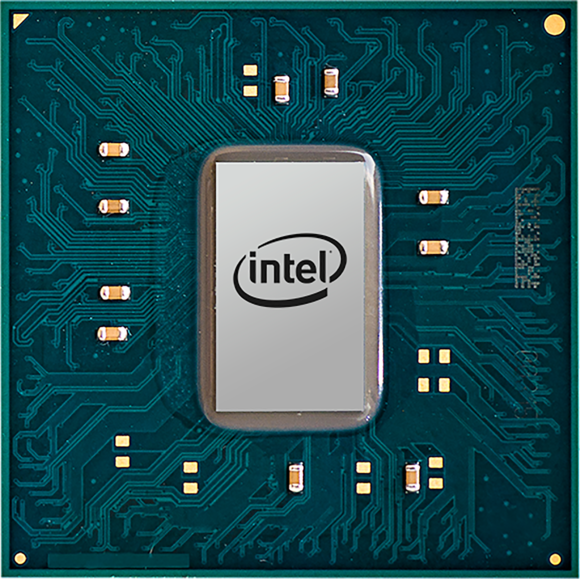 First place goes to Intel’s Skylake Core i5-6300U in the Surface Pro 4. I don’t think anyone who is rational will doubt that. The benchmarks tell the story: For second place, it’s Intel again, with the Galaxy TabPro S’s Core m3. 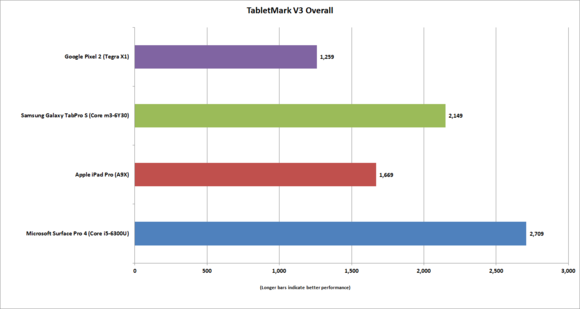 In TabletMark V3, which uses each platform’s APIs to simulate various tasks such as word processing, email, and photo editing, the Skylake Core m3 beats both the A9X in the iPad Pro and the Tegra X1 in the Google Pixel C.
BAPCo’s TabletMark V3 uses each platform’s availlable APIs to simulate web browsing, word processing, email, and photo editing. Moving on to graphics performance, I ran Futuremark’s 3DMark on all four devices. 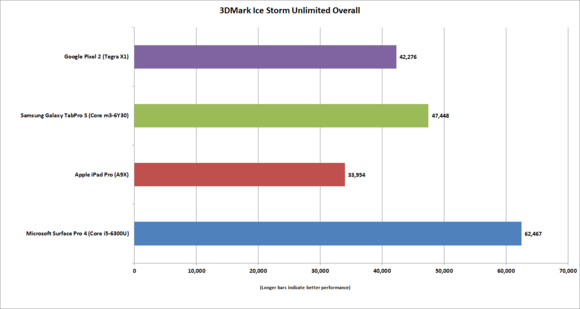 Below, you can see the overall performance of each device in the Ice Storm Unlimited test. The test factors in the CPU performance for games physics and employs real-world techniques that are used by game developers. When you factor in CPU performance for game physics, both Intel chips open up a larger lead over the Tegra X and A9X. Here’s the pure graphics performance of the four devices. PC faithful should take note: ARM chips, once thought to be inferior to the mighty x86 in the PC (not including Atom, of course), are getting pretty damned close. 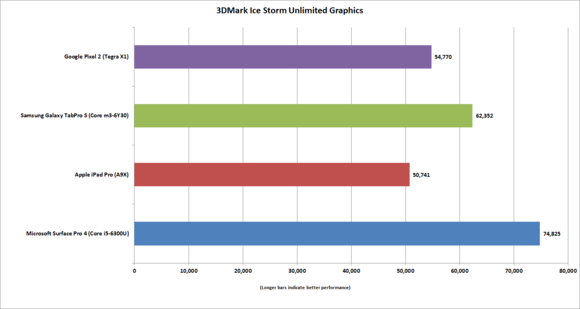 In just the graphics portion of 3DMark Ice Storm Unlimited, it’s pretty close between the two ARM-based tablets and the two Intel chips, but still no cigar. Full details on the new iPad Pro’s screen aren’t known, but Apple has said it’s a photo-aligned IPS panel similar to the one used in the big iPad Pro. Display experts have described the big iPad Pro’s panel as “Very Good to Excellent.” So take that screen and decrease its reflectivity, then give it the ability to adjust its color temperature based on the environmental light, as Apple has done, and you’re probably going to get a top-notch panel. That said, Microsoft’s Surface Pro 4 is no piker. Display expert Ray Soneira called it “one of the very best and most accurate displays available on any mobile platform and OS.” Soneira, who apparently tore down a Surface Pro 4’s screen to measure its power consumption said it uses less power than an iPad Air 2. The wild card here is really Samsung’s Galaxy TabPro S, which uses an incredible 12-inch Super AMOLED panel. The Surface Pro 4 and new iPad Pro both have IPS panels, which use traditional LED backlighting that can sometimes be uneven or blotchy (although Microsoft and Apple usually bring their best efforts to this game). Super AMOLEDs are hard to beat when it comes to pixel persistence and black levels. The latter is a consequence of the way AMOLEDs work: When something’s black, there’s no light being produced, while traditional IPS panels have to mask or block the light, with varying degrees of success. Still, without a visual confirmation of the iPad Pro’s screen qualities, there’s no way to determine a winner, so I’ll leave this category TBD for now. 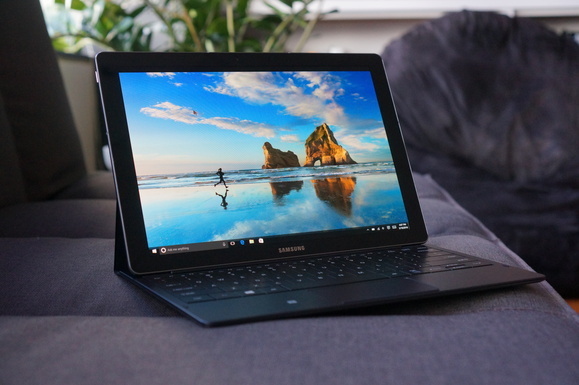 But I can tell you that Galaxy TabPro S’s display is to die for, and will be a tough one to beat. The iPad Pro has a “photo-aligned” IPS panel but the Samsung Galaxy TabPro S has a drop-dead gorgeous Super AMOLED panel. Comparing the battery life of different devices is no less difficult than trying to compare the gas mileage of different cars—particularly when you take usage into account. For example, it’s unlikely even a Prius would get great gas mileage if it were being driven by NASCAR star Danica Patrick. Still, we can look at the specs and make a few guesses. The Surface Pro 4 packs a 38-watt-hour cell and features one of the most power-efficient IPS panels around. The small iPad Pro packs a 27.5-watt-hour cell, which is about 25 percent smaller than the big iPad Pro’s 38.5-watt-hour battery. The Samsung Galaxy TabPro S’s gas tank is 39.5 watt-hours. From my experience, the battery life on the Surface Pro 4 is good. You get about 6.5 hours of 4K UltraHD video playback on the Core i5 model. On the small iPad Pro, I’d expect battery life to easily exceed the Surface Pro 4’s time, given its power-sipping A9X CPU. Apple rates the device at 10 hours of video playback. Of course, it doesn’t specify the video resolution or the brightness setting, but iPads have always been known for great battery life so it’s probably pretty respectable. Again, the Samsung Galaxy TabPro S is a wild card. With its Core m3 CPU and Super AMOLED panel, it’ll give you just shy of nine hours of run time with 4K Ultra HD video. That’s pretty phenomenal considering the battery size. Under most circumstances, I’d call this category for the iPad, but judging by Apple’s own numbers, there’s a good chance the Galaxy TabPro S could force a tie. Winner: TBD, but a tie between the iPad Pro and Galaxy TabPro S seems likely. 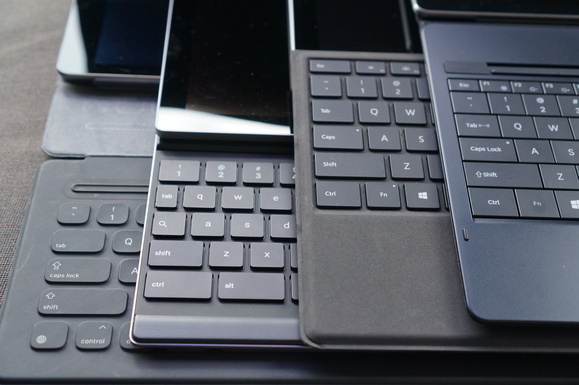 Stack o’ tablets: From left to right: Apple iPad Pro, Google Pixel C, Microsoft Surface Pro 4, Samsung Galaxy TabPro S.